The leader of one of the largest aggregate-producing companies in North America, C. Howard “Ward” Nye has served in important roles in the industry, including his work with the National Stone, Sand & Gravel Association (NSSGA). 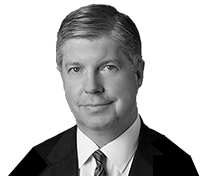 Nye has been chairman of the board of Martin Marietta Materials Inc., the second-largest producer in the United States, since 2014. He has served as president since 2006 and as CEO and a director since 2010. He also worked as COO from 2006 to 2009. Nye was appointed CEO of the company in January 2010 in the midst of the global economic downturn. Since that time, he has led Martin Marietta as the company carefully executed its strategic plan and delivered a strong performance for investors. Of the company’s future, Nye says, “We remain confident in Martin Marietta’s long-term outlook, with the fundamental drivers for broad-based construction activity supporting a steady and extended, yet somewhat slower than anticipated, cyclical recovery across our geographic footprint. 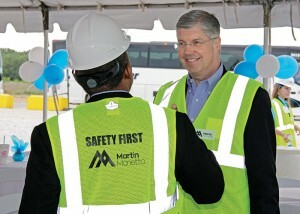 Prior to joining Martin Marietta in 2006, Nye served as executive vice president at Hanson Aggregates North America. He worked as president of Hanson Aggregates East from 2000 to 2003 with operating responsibility for more than 150 facilities in 12 states, and with annual revenue of more than $500 million. He served as the vice president of business development for Hanson Building Materials America from 1997 to 2000. He began his career in the aggregate industry as general counsel for Hanson Aggregates East, with additional responsibility for environmental, safety and health. From 1987 to 1993, Nye worked for the Raleigh/Durham, North Carolina, firm Nye & Wolf P.A., a boutique construction and commercial litigation law firm with a practice primarily involving representation of owners, contractors, subcontractors, architects, engineers and suppliers in all aspects of the construction and construction materials process, including sophisticated land-use and development matters. In 2006, global parent company Hanson was the world’s largest producer of aggregate. Nye’s role was in the North American segment of Hanson’s business, which was number three at the time in the United States, behind Vulcan Materials and Martin Marietta. Nye is a past chairman and current executive committee member of NSSGA. He emphasized “building bridges” on policy issues with like-minded groups, coalitions, state associations and state governors in pressing for a new long-term highway bill and dismissing short-term extensions. In addition to his educational, professional and executive roles, Nye has been a gubernatorial appointee to the North Carolina Mining Commission. He also currently serves as vice chairman at-large of the American Road & Transportation Builders Association and as a director of the United States Chamber of Commerce, the world’s largest business organization representing the interests of more than 3 million businesses. Nye has further served on numerous other state, community and charitable organizations, including the Duke University Alumni Association Board, Wake Forest University School of Law Alumni Board, and as vice chairman of UNC Rex Healthcare’s board of trustees. Nye also is an independent director of CREE Inc., a multinational manufacturer of semiconductor light-emitting diode materials and devices, where he is chair of the Governance and Nominations Committee and a member of the Compensation Committee. Nye completed his undergraduate studies with honors at Duke University in 1984, and he received his law degree from Wake Forest University in 1987. Nye and his wife Laura reside in Raleigh, North Carolina, and they have three children.